Habit: Shrub. Stem: +- tomentose. Leaf: alternate and generally clustered in axils, linear to (ob)lanceolate, sometimes persisting as stiff spines, glabrous to tomentose. Inflorescence: heads discoid, axillary or in +- rounded or flat-topped, terminal clusters; involucre cylindric to hemispheric; phyllaries 4--6 in 1--2 +- equal series, often keeled; receptacle flat, epaleate. Disk Flower: 4--9; corolla cream to yellow, lobes long, spreading or recurved; anther base +- sagittate, tip obtuse or acute; style branches papillate to short-bristly, tips truncate to conic. Fruit: obconic or fusiform, often 5-angled; pappus 0 or of generally many bristles or slender scales. Species In Genus: 10 species: western North America. Etymology: (Greek: 4 together, from 4-flowered heads of some species) Toxicity: Esp flower buds TOXIC to sheep (toxicity poorly understood). Habit: Plant 1--8 dm, unarmed. Stem: unevenly tomentose, becoming +- glabrous in stripes below nodes. Leaf: main leaves <= 4 cm, +- (ob)lanceolate, tomentose to silvery; clustered leaves like (generally <) main leaves. Inflorescence: heads generally 3--6(10) in flat-topped clusters; peduncle 5--15(25) mm, bracts 0; involucre 6--8(12) mm, cylindric to obconic; phyllaries 4, oblong to ovate. Flower: 4; corolla 7--15 mm, creamy to bright yellow. 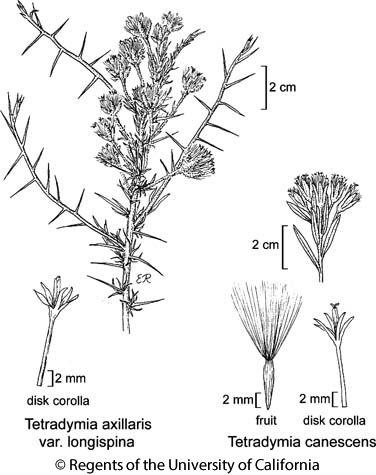 Fruit: 2.5--5 mm, glabrous or short-stiff-hairy; pappus of many fine bristles, 6--11 mm. Chromosomes: 2n=60,62,90,120. Citation for this treatment: David J. Keil 2012, Tetradymia canescens, in Jepson Flora Project (eds.) Jepson eFlora, http://ucjeps.berkeley.edu/eflora/eflora_display.php?tid=5292, accessed on April 23, 2019. CaRH, SNH, TR, s PR, GB, DMoj; Markers link to CCH specimen records. Yellow markers indicate records that may provide evidence for eFlora range revision or may have georeferencing or identification issues. Purple markers indicate specimens collected from a garden, greenhouse, or other non-wild location.